In the Hermitage in Saint Petersburg I saw this man. I asked him whether I could photograph him. I speak about ten words of Russian – mostly taught to me by Tamara, who had the patience to listen the CD before we went to Russia. But my Russian didn&apos;t stretch to asking the man whether I could take his photo.So when I say &apos;I asked&apos; I mean I raised my camera a few inches and moved my eyes between the man and the camera and gave a &apos;may I&apos; look. He was very pleased and amenable and I took the photo. Of course, we were in one of the very big rooms of the Hermitage – big enough for a grand ball – and the windows were off in the distance, so the lighting was poor. That said, a photo is better than no photo, so I pressed the shutter. Now the question was, who had I photographed? Was he a hero of the Soviet Union? I mean that absolutely straight up. I was madly calculating whether it was possible that he had fought his way to Berlin. It&apos;s a bit of a stretch. If he was 20 in 1945 he would be 92 now. Did he look 92? Well, I didn&apos;t have time to make the calculation. When Tamara and I got back to England I asked people on Metafilter (a great place to ask questions, by the way) if anyone knew what medals he was wearing. Here are the replies. 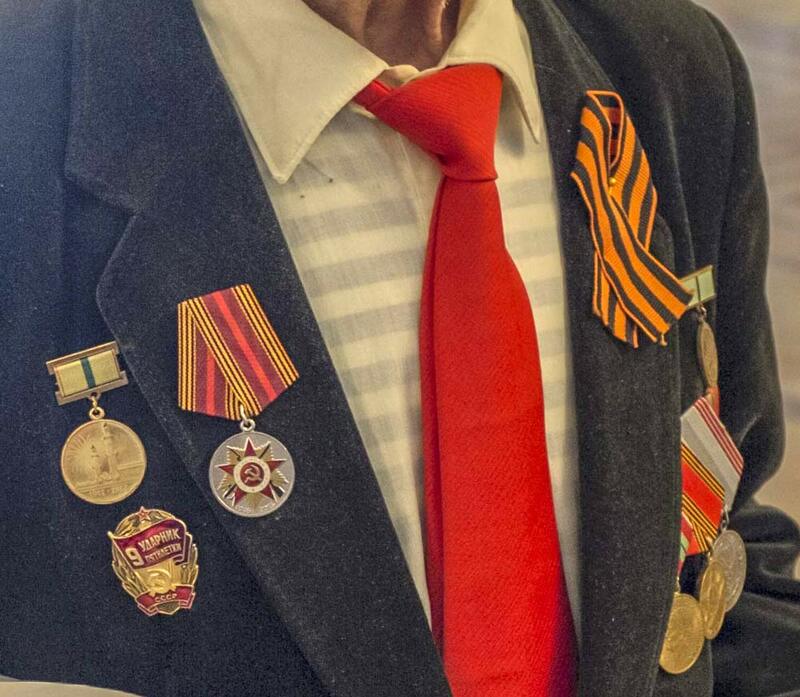 On his right (our left) lapel, that is the "Order of the Patriotic War" (WWII or the Soviet-German war.) Some were issued as early as 1942 but they were given in 1985 to all living WWII veterans in the USSR. He&apos;s wearing the anniversary edition of that medal, given to veterans in 2015 (emblem is on round backing, has pendant loop, with ribbon). 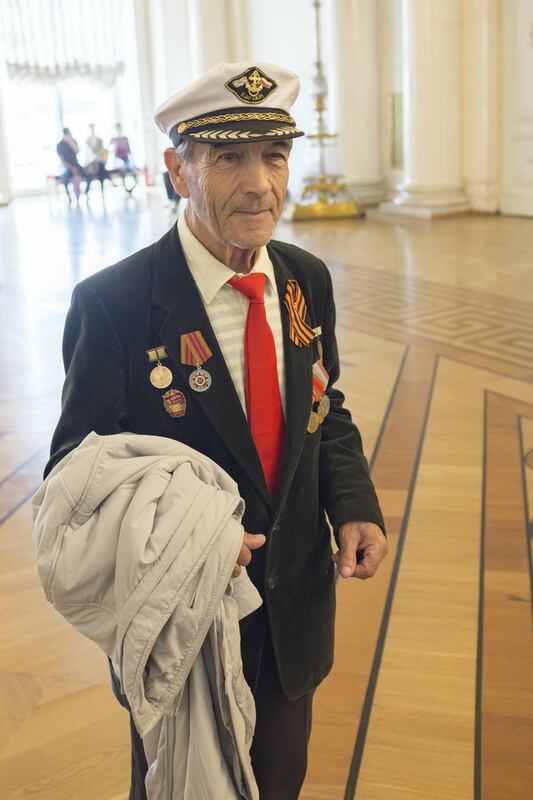 His peaked cap has the Russian naval ensign and the Russian Federation flag on it, though it&apos;s not an official uniform cap as far as I can tell. The black and orange ribbon is presumably a St. George ribbon. Assuming he was wearing his own medals, that would indeed make him a veteran of WWII. I have to say I felt something when I saw him. Tamara and I had been to the Museum of the Siege of Leningrad (what Saint Petersburg was then called), and I have read a bit about what things were like in Russia at that time. So it was like stretching a hand through history to be near this man. I don&apos;t mean I admired him or idolised him or in some way elevated him, but he was there at a cruel time so far removed from the room in which we were standing, and he made that time seem a bit nearer. A fantastic photo and a fascinating chap. He looked pleased someone wanted to take his photograph. And he has a face that has seen a few things. Yes, Metafilter is a good place to ask questions – used by people of all stripes rather than a narrow/similar profile. And it has escaped the scourge of people trying to game the system by spamming it.